With her groundbreaking research and efforts to promote women in the field, Dr. Laurie Glimcher has established herself as a pioneer within the scientific community. Last year, the world-renowned immunologist hit another milestone when she became the first female president and CEO of the Dana-Farber Cancer Institute in Boston. Glimcher says it's a great time for cancer research, adding that she hopes to build upon her work on cancer treatments that activate the body's own defenses to fight off the disease. Dana-Farber was established in 1947 and employs over 4,500 people who support more than 450,000 patient visits a year. The institute is involved in about 900 clinical trials. Dr. Ellen Gravallese, a professor of medicine at the University of Massachusetts Medical School and division chief of rheumatology at UMass Memorial Medical Center, believes that despite possible federal funding cuts to research, Dana-Farber is poised for success under Glimcher, whom she called a mentor. Gravallese was a postdoctoral research fellow in Glimcher's laboratory at Harvard Medical School. "If the experimental work was not progressing, she had the brilliance to approach the question with an entirely new insight or strategy, always insisting on getting to the answer," Gravallese recalls. While at Harvard, Glimcher used her own research dollars to pay for lab technicians who could help doctoral fellows maintain a work/life balance after they started families. 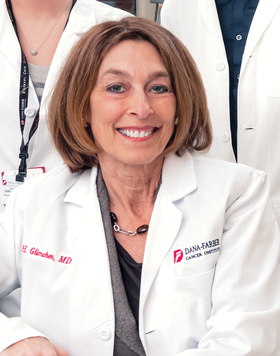 When Glimcher was dean of Weill Cornell College of Medicine, she created a program to promote greater diversity among the institution's faculty, established maternity leave and day-care centers, and added two female department chairs where there previously were none. Family has played a big role in Glimcher's own career. While at Harvard, a notable research collaborator was Glimcher's own father, Dr. Melvin Glimcher, who was chair of orthopedic surgery at Massachusetts General Hospital. Glimcher's oldest son, Dr. Hugh Glimcher Auchincloss, is a cardiothoracic surgical fellow at Mass General, and her first husband, Dr. Hugh Auchincloss Jr., was a transplant surgeon there. "So, coming back to Boston, to Harvard, and especially to Farber, was just a dream job for me," Glimcher said. She adds that being a physician helps her maintain a patient perspective. "I think we all, no matter if we're in the laboratory, or in an administrative office, or at the bedside of a patient, to me, the patient is always the center of everything that we do," Glimcher said. "When I wake up in the morning I never have to wonder why I am going to work."